Neon signs are bright fluorescent-like signs that are often used to give directions, suggestions, and explanations for businesses, concerts, and demonstrations. Neon signs are created using bent glass tubing and neon gases. After the tubes are bent into a particular shape, they are connected to an electrical source, such as a power outlet. As the electricity goes through the tubes, the molecules begin to move and the electrons emit more energy. As they fall back, they emit a particular wavelength of light that is going to be equal to the amount of distance that they have fallen back to. Neon light is typically an orange-red. Different colored gases can change the color of neon lights. These tubes can last for years or even decades. 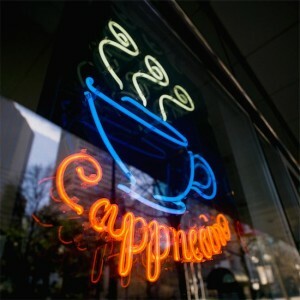 Neon signs are often chosen over other other types of signs because they stand out brightly in dark places. They are also more visible and harder to ignore or pass by without reading. They give a bright impression to anyone who sees them. Neon signs are typically posted outside or inside of venues that are more associated with night time activities, such as bars, dance clubs, or even restaurants that are open late. The neon tubing is usually bent into letters to advertise names or venues or left in long lines, to make a place more visible. Cities like Las Vegas, where a lot of night life is common, are often filled with neon signs advertising all sort of different venues that are competing to stick out more than the others.